— Judge, 5th Annual Writer’s Digest Self-Published eBook Awards. Yours Truly is back, with a few words on the challenges of writing and marketing a multi-genre novel, and putting story before convention. Yours Truly is back, with a few words on how Drip: A Gothic Bromance, and horror in general, reflects the world we live in. Yours Truly reads from Drip: A Gothic Bromance. At around this time, I attended the wedding of one of my best friends from high school; at the reception I found Kate and myself sitting next to a very upbeat, clean-cut guy. I figured he was in finance or professional sports newscasting, but no: he was an illustrator. I told Peter what I was working on, and he got very excited. I took his card, thinking, he's just being polite, and odds are we won't make a good fit. A few days later, I took a look at Peter's site (http://www.peterwonsowski.com); I was blown away: his watercolor and acrylic work was tonally broad: there was lighthearted, cute content, but also darker stuff (think Dark Knight Returns graphic novel). Drip is tonally on the darker side, and I could see that it wouldn't put Peter off. I got in touch with him, and was amazed to find that his enthusiasm was genuine and consistent. We spent several months working long distance, with me giving Peter the background on the characters, Peter sending me sketches, me giving input, and Peter honing in. It was a great time! The resulting illustrations were made into poster-boards for pitch meetings, and I started putting out inquiries. No one bit--which even now is painful to write when I think about all the work that went into the story and the presentation. Such is the nature of taking an artistic risk. Those of you who've seen the book trailer have seen the sketches and illustrations of Peter Wonsowski, an awesome artist and lovely human being. To understand how Peter's work came to be part of my trailer, you need a bit of background on Drip's development. Drip: A Gothic Bromance actually started life as an original screenplay, written and developed by yours truly. I had hoped to direct it as a follow up to my feature mockumentary, The Devil's Filmmaker: BOHICA. However, 2008 changed my thinking; the bright filmmaking future of the digital revolution had darkened, with professionalism vanishing from low-budget, indie filmmaking--both in terms of culture and the income. All the film editing listings my business partner and I saw were looking more and more like low-ball want ads for web-design/computer-programming/graphic-design experts--not what I signed up for. Then, when the financial collapse hit, my wife and I, who had just gotten engaged, were forced to rethink living in New York City (if you count Astoria, Queens as New York). In 2010, we relocated to Cleveland, Ohio, where we could afford to start a family. Soon after, my wife got hired as registrar at the Museum of Contemporary Art (MOCA Cleveland), and I began consulting work in property management. Still, I hoped to drum up interest in getting Drip made. I thought about producing some concept art and pitching it to some of the local film programs. Ok, so first thing's first: I've got a genre-bending novel coming out at the end of this month. 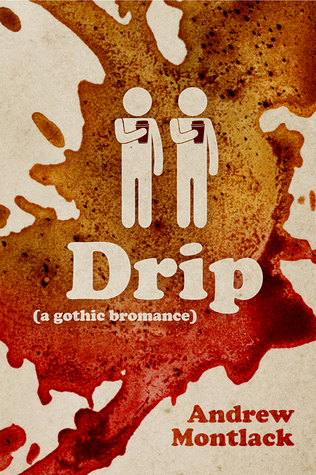 It's called Drip: A Gothic Bromance, and I've started this blog because, apparently, I have to. Hopefully my musings will entertain and provoke, and sell copies. Cute comments aside, I did not write Drip for money--at least not today-money, tomorrow-money, or any serious next-year or year-after-that money. The way I figure, a really good outcome would be a lot of people dig the book so much, we all want to read more of my mishugas (yiddish; roughly translated: busy-ness), and then maybe I get an opportunity to write another novel, novella, or short story. What I've wanted most for Drip was to tell a great, quirky coming-of-age story about the middle-class heartbreak that graduating college and entering "the real world," has become. Most of my adult life has been in filmmaking; a lot has been said about great films challenging us, but I also feel like a lot of my favorite movies gave me a kind of social comfort--particularly at a dark time (like now, if you follow the national press)--a sort of countercultural wink--a sense of "thank God: someone else sees how messed up things look--I'm not the only one who thinks this way." What movies am I talking about? Donnie Darko, Chinatown, Harold and Maude, Midnight Cowboy, The Graduate, Willy Wonka and the Chocolate Factory, RoboCop, Punch Drunk Love, You're a Big Boy Now, some of the best of 1970's cinema, along with a precious few contemporary torchbearers. Anyway, that's the sort of feeling I wanted to evoke with Drip.